Ferguson elections: Two black candidates, Ella Jones and Wesley Bell, on the City Council. 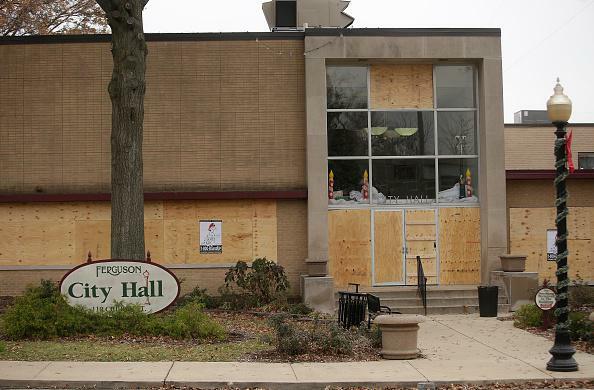 Ferguson City Hall in November 2014 after a grand jury chose not to indict Darren Wilson for killing Michael Brown; the windows are boarded as a precaution against vandalism. The election of candidates Ella Jones and Wesley Bell to the Ferguson, Missouri, City Council on Tuesday has increased the number of council seats held by black representatives, in a city that’s 67 percent black, from one out of six to three out of six. (The city’s white mayor, James Knowles, also votes on council decisions.) Voter turnout was 30 percent, up from 12 percent in the city’s last municipal election in 2013. The City Council will be responsible for hiring a new city manager and a new chief of police; the men who held those positions resigned in March.